With Goya`s painting we saw art get political. He was reacting to repression by the government against civilians. The light in this picture shows us who the “good” people are, but it also exposes them to the firing squad. Many of the things people cherish are lost here- the power of the church, the power of the individual. Goya`s challenge to us is to ask- What will happen in the next moment? This is a painting that appeals to our feelings much more than to our eyes. 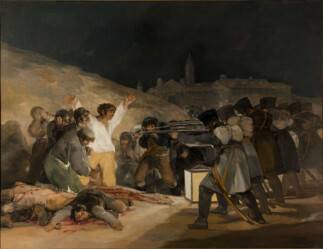 Goya, F. (1814) The Third of May 1808. The Prado, Madrid.